When scientists at UC Merced seek to better understand California’s biodiversity, they turn to cutting-edge genomics. They also turn to their neighbors. 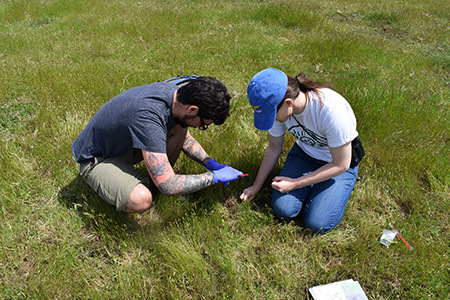 On a sunny Saturday in April, scientists joined forces with members of the local community to take part in UC Merced’s inaugural eDNA BioBlitz. 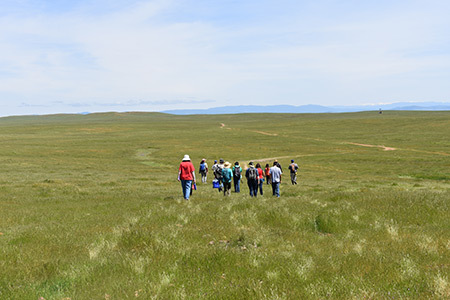 Under the guidance of Professor Michael Dawson and a team of conservation biologists from UC Merced, UCLA, and Cal State Los Angeles, community members trained as citizen scientists and spent the day collecting and cataloging environmental DNA (eDNA) from the Merced Vernal Pools and Grassland Reserve. “What is eDNA? It’s a really new science,” reserve director Mo Kolster explained to the nearly two dozen participants, anticipating the crowd’s most pressing question. As soon as they’re collected, eDNA samples are sent to UCLA laboratories for genetic analysis. The resulting data will aid researchers in assembling a catalog of plant and animal species that interact with the vernal pools. Importantly, eDNA provides a molecular tool that can reveal what the eye can’t see, including vernal pool species that have managed to elude observation. Some are too small to be seen with the naked eye. Others are transient, finding their way to vernal pools at irregular intervals and staying only a short while. Whatever the reason, eDNA offers a way to remedy these oversights. By giving scientists the ability to identify species on the basis of their unique genetic signature, eDNA allows scientists to detect members of the vernal pool community as yet unaccounted for. Ultimately, the eDNA samples collected by citizen scientists at BioBlitzes held in Merced and throughout California will supply conservation researchers with a more thorough catalog of regional biodiversity in the state’s many unique habitats. It will also provide a deeper understanding of how California’s changing environment affects the flora and fauna occupying these habitats. The BioBlitz was organized as part of the University of California’s CALeDNA project, a trailblazing conservation research program that utilizes the tools of genomics to track biodiversity throughout California. The project falls under the umbrella of the University of California Conservation Genomics Consortium, a collaborative effort that brings together experts from six UC campuses to monitor the health of ecosystems statewide and find solutions to pressing issues related to conservation and biodiversity. The consortium is funded by a three-year, $1.76 million Catalyst Award from the UC Office of the President. Dawson serves as the primary investigator for the UC Merced arm of the consortium. He’s joined by Professor Jay Sexton, whose research focuses on species endemic to the vernal pool reserve. Citizen scientists who missed the April BioBlitz will have another opportunity to participate in October, with additional details to come. For more information about becoming a citizen scientist and participating in future BioBlitzes, visit ucedna.com/participate.